Nope, this isn’t about spiritual sleep or decay… it’s about the actual, physical zzzz-stuff! One of many things that isn’t accented all that much in most surgeries is how one’s stomach will react afterwards. I say this not from personal experience but via sharing that of my wife who just underwent a hip replacement and must do another and at least one knee replacement all due to extreme arthritis. You likely recall that when young, you were probably not all that interested in naptime. As in “Honey I Blew Up the Baby”: “NOOO Nap”! Yet as one hits their late 20’s and beyond, naps at least sometimes, seem quite the gift. I went through days, even weeks in my 20’s when naps were just not an option, and at that point I still didn’t really want nor think I needed them. As I aged I not only appreciated them but welcomed them. “Do not love sleep” as well as “The Lord gives His beloved sleep” (or “rest”). On the one hand being a slacker or slug about responsible living and work is not God’s plan for anyone. On the other, He understands human limitation and need and in His love brings rest and sleep to us to meet such need (major example, the Sabbath). During Wendi’s rehab due to both pain, a sane schedule of medication-taking as well as stomach issues and toilet needs we found ourselves only able to sleep somewhere between an hour or so and perhaps 3 hours at a time. Being a musician (!) all my life I’m often asked “How do you feel?” and my standard response is often “I’m starting to wake up a little bit” even if it’s 3 o’clock in the afternoon… and I’m not always joking. Musicians are often not all that lucid until about that time as we end up getting to sleep for the night quite late (or early depending on your perspective), therefore sleeping later in the morning or even early afternoon. So you can imagine how my body was responding to waking up (not really Waking Up) every couple of hours for several weeks in a row. I’m not supposed to love sleep… but I sure do sometimes! As we age or due to circumstances of sporadic workloads, illness, etc., there will be those times throughout life when sleep is such a desired gift, such a solace and hug that you just can’t wait to get some. Aging often brings insomnia and both I and plenty peeps I know in their sixties and older wake up in the middle of the night or an hour or two before dawn and for no apparent reason cannot get back to sleep. I find praying a great deal, listening to (or reading on the Web) news and sometimes writing are all helpful and even edifying things to do in such times. Through making good changes in diet, exercise and such one can help ease transitions and burdens to get a better night’s rest. Changing to a different mattress, etc., can all help- yet all of these and more are not fail-safe adjustments toward regular sleep habits for life often has its twists and turns. As Wendi and I raised our children and currently with grandchildren close, various sickness, etc. means sleep gets interrupted no matter what your plan may be to get enough. Lastly, from both ministering to hurting people with mental/emotional/physical issues, even very wise, balanced folks who have lost a loved one, sleep cycles can change-up without warning. Sometimes sleep becomes a drug of choice used to escape whatever ails one. I found myself really desiring more sleep in part to find peace in nights when Wendi was in real pain during those moments there seemed nothing we could do to fix it. Depression is both brought on by lack of restful sleep and also at times part of what may help cure depression and other anxiety or disorders. I’m certainly no professional nor anywhere near an expert, but these are some of my own observations… while at least partially awake. All of this to say that sleep is something worth considering as it’s such a large, needful part of life and indeed affects each of us as well as those around us both in terms of their relationships as well as our own ability to function and even cope with life’s ups and downs. The longer I live the more I appreciate this gift from God! The truth is- I still don’t always want to stop for naps but sure do like ’em from time to time! Well… it’s now 3:44 a.m. so I’m going back to bed. Spent the weekend with a good group of friends, a number of new ones and several older ones up in the Greenwood, Wisconsin area at the WI State ABATE campgrounds. It was ABATE’s Summer Hummer state-wide gathering featuring several bands and all sorts of activities for bikers who care about representation, safety and of course, hanging out with other bikers. There were quite a few families as well as singles and various clubs involved. So Indianhead (which that area of the state is called) Bikers For Christ invited me up to bring a sort of Sunday morning service-kinda-concert from the stage as they served a great free breakfast to peeps before most of them would be leaving for home later that day. Pastor Fred Z, BFC Pres. and I are longtime friends and it’s been my pleasure to visit (and gig) with him and his Full Throttle Band. As BFC has chapters world-wide it’s very cool to get to know more of them- and the Indianhead bros. and sisters are gems indeed. Local BFC Pres. Corky and his sweet wife Jen were just so cool, genuine and fun to meet and work with! 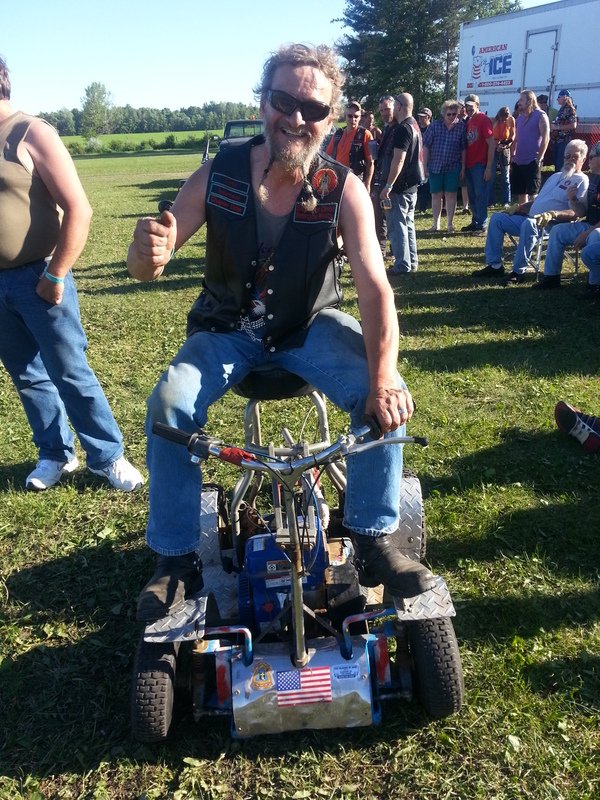 Corky won the barstool race (see the seat on his lawnmower-powered ride!). They set up a racing circle with cones, do the race flags and etc., and of course some folks smack into one another or wipe out. It requires a barstool for a seat (regs. are 32 inches high) so the sense of balance is a huge factor. 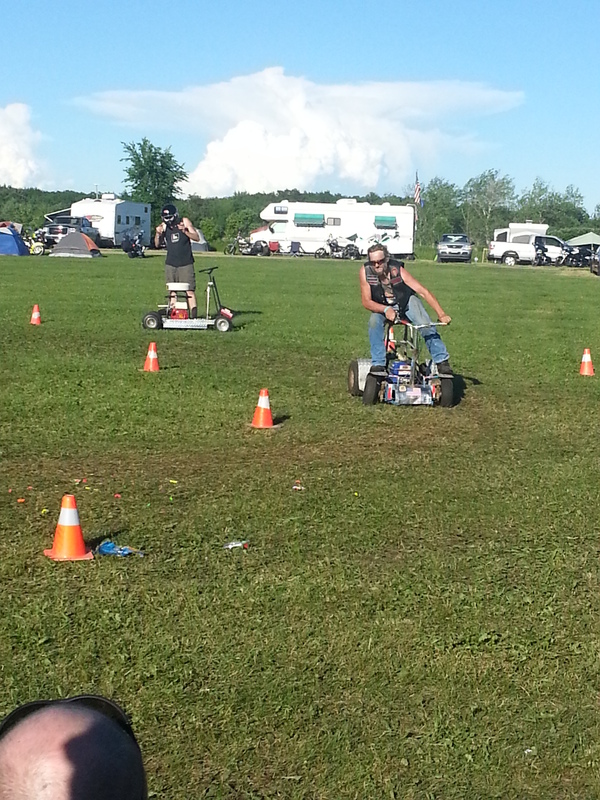 Corky’s machine does 30mph… quite a trip with a wheely bar no less! It was interesting to see bikers who stalled out reach down to pull a lawnmower cord and jerk it to get their “bike” up and back in the race! Really fun stuff. Saturday night we broke out guitars and harp and played a little blues along with a cookout (nice smoked bird!) and then off to bed. The breakfast and set/service was very kindly received and we had many great chats with people afterwards. There were many colorful peeps and rides, so I had to include a few of ’em here. Now where is an old lawnmower I can convert… hah!! My longtime friend and REZ, GKB bassman Roy Montroy as always, was a gift. He’s a co-conspirator, driver, amazing sound-tech and more who sometimes joins me in these solo adventures. AND, my Wendi’s finally beginning to feel a bit better in her stomach re. the post-hip replacement opp. meds… so thanks for the many prayers and kind words! Hope you’re having a great summer and hope to see some of you at AudioFeed Festival (see earlier post) next week. 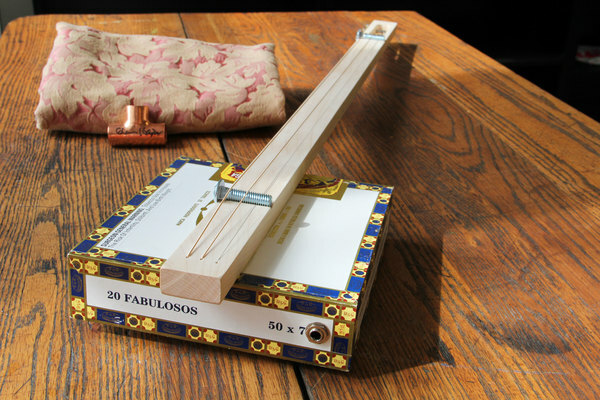 If you’re anywhere near Chicago, I’ve been invited to put on (with help from a number of good friends) an a.m.-to-p.m. Cigar Box Guitar and bass-building workshop, then feature these guitars and music on ’em for an evening show. It looks like overnight accommodations and a continental breakfast will also be available for those wishing to stay over on the Sat. night. Soon as all options and details are finalized I’ll post them- but the date is Saturday, August 9th, 2014 at Wilson Abbey, Chicago. So where and what is Wilson Abbey- and what else is happening there besides the amazing fair trade Everybody’s Coffee shop? Wendi’s hip replacement has gone well but the rehab is just beginning. She deals with constant stomach pains and nausea due to pain meds. along with pain in the other hip which along with the knee on that side as well as likely the other knee all need replacement and shall be over the next couple years…). Major arthritis folks. We’ve been SO blessed by the prayers and encouragement of many, many friends world-wide. No other way to get through spurts of 2-hour naps interspersed with food, toilet, rehab, shopping, house cleaning, laundry, dishes and the regular stuff of life. We have several AMAZING, EXCELLENT friends who are helping with some of these, but just getting enough sleep is a major deal at this point. I am her main 24 x 7 caregiver. So you’ll understand why I’m very, very careful about what potential gigs to say YES! to this summer. We just have to see how things go with her health issues at this point. There are a number of shows booked and as we near each one I’ll be sure they’re posted in my blog, Facebook, Twitter and via Grrr Records, etc.. They are all pretty close to Chicago. For those of you asking for summer dates or waiting for my response re. the possibilities, my sweet girl is my first priority so -maybe next summer, Lord willing! If you’ve read this far, thanks! Meanwhile I may just toss a song out now and then via this or that website, do a writing project and continue to rehearse cigarbox guitar and one-man-band tunes. 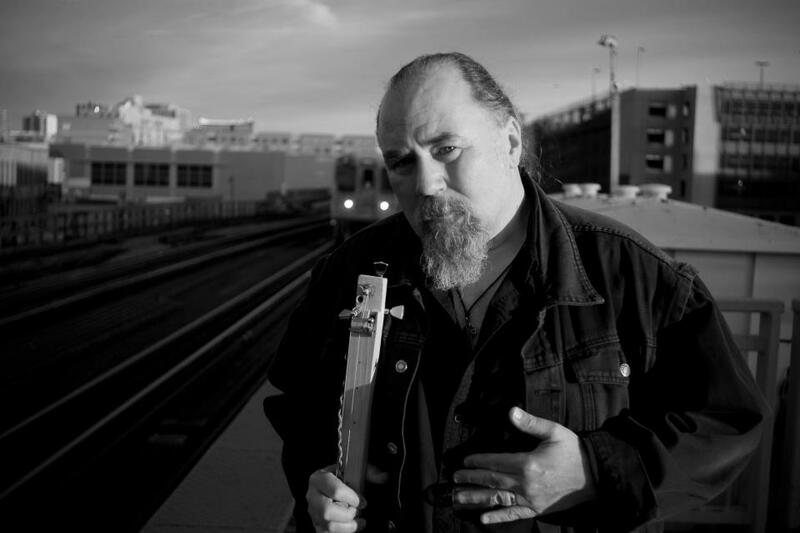 I’ve learned quite a few covers from Delta and other blues peeps, and along with many I’ve written I’m very excited to get that music out, live and via recordings… but all in good time. Wendi comes first! And of course I’ll continue to post here in my blog at WordPress, in Twitter and Facebook when I think I’ve something to say or pass on that would be helpful or encouraging. Thanks SOOO much for your many kind words and offering opportunities to gig, come rest at your place, etc., etc.. I truly appreciate them, as does Wendi for your continued prayer as we share the journey together with Jesus and our extended family in the Lord. So here’s that list for reference again and my final thoughts on it. 25. It is not automatically selfish to do things that bring you happiness. I am an older, holiness and rather serious Christian who nevertheless is not stoic about life and creativity! I am in fact happy to be writing this blog even as I type 🙂 Yes. 26. See my comments for number 1, There have been days in the studio when I and others with me knew the inspiration just wasn’t happening. So we left and did other stuff, came back the next day and rocked! Yes. 27. Words can inspire and I use dictionaries and other word-sources often for broadening my own sense of thought in the English language. I purposely stay away from what I might call “university” or “theological seminary” speak… because “the common people heard Him (Jesus) gladly” and I would rather be heard and the point considered than impressive with my command of the vernacular… but you get the point:) Jazz drummers who play rock or blues with passion are often the best drummers imho. They have “chops” far beyond what they may use and that can indeed help them do amazing things as they jump to a fresh style. 28. Here (“framework”) is like saying “you’re used to using paper and pencil… try canvas and a brush and paint”. Or moving in closer, “Decide your subject boundaries, then work within them”. For me, solo, duo or 3 piece is a framework that forces me to think, write, play and sing differently than if I worked in a 9-piece band…. which I’ve also done but you understand my meaning. Again, it’s helpful to narrow your “frame” of reference and then begin to create with that in mind. Some boundaries are better than none most of the time. 29. Boy do we work to impress this or that person and condemn ourselves to hell on earth when we “miss” our target! Absolutely. We can stress ourselves right out of creativity trying to perform up to this or that person’s standard. In the early years of REZ Band I often had issues communicating with grace and kindness what it was I was trying to get us to do as a band for a particular song. Very young and foolish, I would often get impatient trying to verbalize a point so I’d simply ask for the person’s instrument and play it (as I play several instruments). As time went on I realized that what I needed to be was a great deal more flexible, not accepting just -anything- as good enough, but also allowing the other musicians to learn, grow,come into their own musical “voice” and to take my core idea and re-work it where they were more happy and at peace about it. Thus we became a band, not “GLENN KAISER and posse”. The reverse is driving yourself crazy to do it EXACTLY as another creative person demands you do it. Sometimes you can’t, sometimes your idea may actually be better… not always of course, but there must be some give-and-take and a willingness to be friends, not merely co-creators who grow farther apart and may even hate one another later! Neither of you were, are or ever shall be perfect on this planet! 30. As per my comments above re. number 2. 31. Yes, there are times clutter clutters one’s mind and creative juices right out to the netherworld due to mess, confusion and the distracting factors of these. 32. If there is only work and no fun, no happy, no pleasure in creative work you are likely going to find a great deal of life rather distressing. Yes. 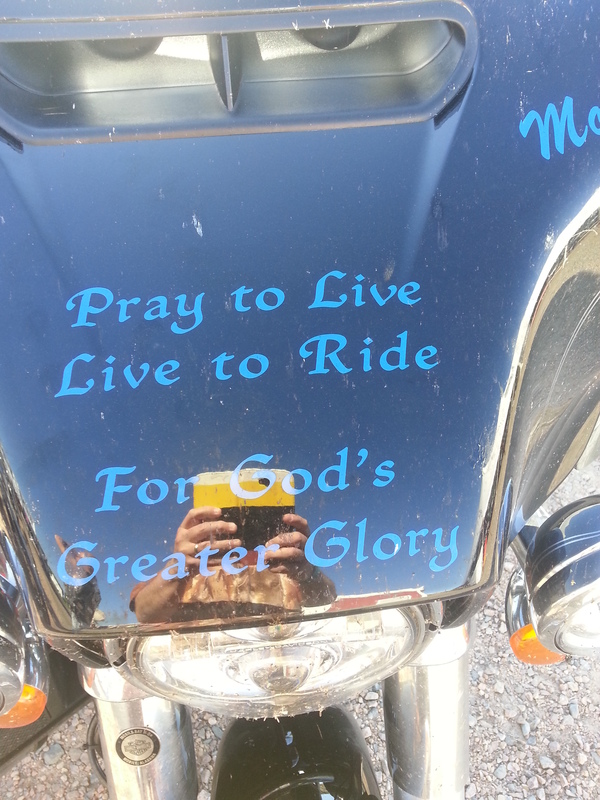 God and His mature peeps are not about being “fun cops”. Play. There is a very real measure of play in creativity. He wired us that way! 33. I found it interesting that the last point was “finish”. Get it?! And this right after “fun”! So the balance of fun and almost seeming to be irresponsible bangs up against the other side of the balance and what is sometimes a tension in life and certainly in creativity: finishing! In any creation there comes a Sabbath. A time to rest from your labor. And there is such a thing as procrastination on the one hand or the other extreme, namely obsessing over the perfecting of one’s work. There is a time to let the kid go, for her to walk (or be sort of pushed) out into the big world at which point they take on a life of their own. All creative work is eventually “cast on the waters” and will sink or swim both on its own merits or lack of them… or the judgment and personal assessment BROUGHT BY OTHERS to the creative work in question. In other words, like it or not, it’s not only your creativity but other’s views which may have nothing to do with what you’ve created… as they judge the quality and value or lack of it in your offering. I find this a truth no matter what area of art or creativity one wishes to consider. And there is really nothing you can do but finish and let it go! At best we have a 50 percent chance of folks loving or at least liking OR finding the work useful, engaging, maybe even brilliant. THEY bring the other 50 percent to your creative work. If you’ve read this far you need thera… I mean, a medal, HA! Let’s create, let’s do all we do to the glory of God. It’s how He made us!